Are you tired of constantly dragging out bezier handles? Does your hand hurt from stretching to hit Shift+Cmd/Ctrl+K? Do you wish that F9 eased those keyframes just a tad bit more? Look no further! 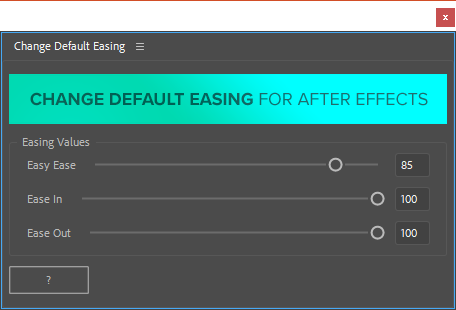 With Change Default Easing for After Effects you can set exactly how much easing is used when you hit F9... or Shift+F9, or Cmd/Ctrl+F9! Simply enter the values you'd like to use for your default easing, assign the helper scripts to your preferred keyboard shortcuts, and animate with ease! Space Curves makes motion paths as simple as "Easy Ease" - Just select a position keyframe and pick a style. After Ease gives you an easy, intuitive UI to tune and create bounce and elastic animations. Easily set the first vertex of masks or paths in After Effects.